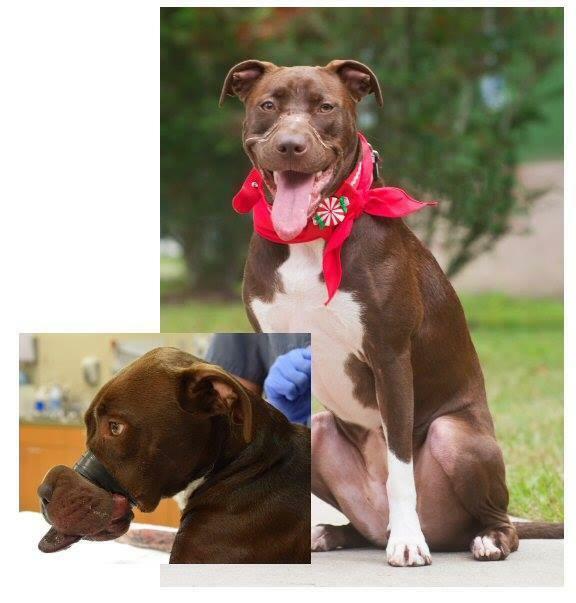 This beautiful chocolate American Stafforddshire Terrier mix survived having her muzzle wrapped with electrical tape, cutting off circulation. After multiple surgeries to reconstruct her jaw and remove dead tissue from her mouth and tongue, she is now the picture of health and happiness, a true portrait of victory over adversity. About seven months ago, Caitlyn the dog was found wandering the streets of Charleston, South Carolina. Her muzzle had been cruelly bound with black electrical tape so tightly that it cut off circulation and trapped her tongue between her teeth. Her injuries were substantial after being left in that condition for what officials and veterinarians estimated was as much as forty-eight hours. She was unable to eat or even to drink, causing her to become dehydrated. The veterinarian who treated her originally thought she might lose as much as one-fourth of her tongue, but advanced procedures reduced the extent of the damage. Police arrested a man suspected of abusing Caitlyn, charging him with ill treatment of an animal involving torture. Seven months later, scars are visible on Caitlyn’s muzzle but otherwise she is a happy, healthy dog. She has been in rehab and foster care while the legal case is pending, but eventually she will be placed in a new forever home with a loving family. A couple of weeks ago, BarkBox.com celebrated Caitlyn’s recovery with what they called her “best day ever”. It began with the mayor of North Charleston awarding her a doggy version of the key to the city. She played what seemed like an endless game of fetch with about a hundred tennis balls, then headed off to a local fire station as honorary firehouse dog of the day with a special friend and favorite human, a firefighter who spent time with her as she recovered. She visited Starbucks and enjoyed a little sweet treat, then on to the Charleston Animal Society where there were enough toys and treats for Caitlyn to share with all the dogs. You can learn more about Caitlyn by visiting her Facebook page at "Caitlyn the Dog". The Charleston Animal Society maintains Toby's Fund to help animals in need. Thanks to the generosity of donors to the fund it was possible to do what was necessary to make a miracle for Caitlyn and other injured pets. Caitlyn is a picture of good that can come out of a bad situation. As we begin this new year, I hope her story will encourage you to reach out and help animals in need. All of us, working together, can help make miracles happen when we’re speaking of pets.